The sound quality on the UE Wonderboom is just good enough to make it a great option for the beach or the pool, assuming you can live with the sub-par battery life. UE is no stranger to quirky waterproof speakers. Just look at the hugely popular Boom speakers or even the oddly shaped Roll, both of which we’ve reviewed in the past. 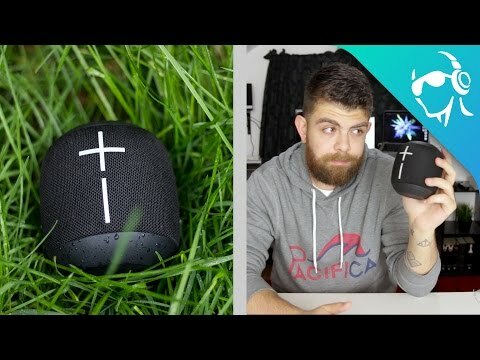 Their newest speaker is the Wonderboom and though we unboxed it on the day it launched, I’ve waited a while before posting this full review because I really wanted to see how it’d hold up over time instead of just after a few days. So how is the Wonderboom? Did UE get it right or is it a swing and a miss? Like the Roll before it, the first thing you’re likely to notice about the Wonderboom is its odd shape. If you took the tall and cylindrical UE Boom and morphed it with the flat disc-shaped UE Roll, you’d get this fat, short soda can looking speaker. It’s actually kind of cute looking which I’m pretty sure is what UE was going for. Up top you’ll find three buttons (one of which is the UE logo) and a small elastic loop. At first I wasn’t sure what the look would be good for since it’s so small, and after using it for a weeks I’m still not entirely sure to use it for. The only use I can find for it is to hang it from a towel rack. I guess you can also hang the speaker from something like a carabiner off your backpack, but it seems a little too bulky for that to be a comfortable way to carry it. But I digress, on the bottom of the speaker you’ll get a small plastic flap that covers the micro USB input. I would’ve liked to see USB Type-C since that’s the way everything is going, but that’s the future-proofing nerd in me. I’m sure most people don’t mind using micro USB. The speaker is wrapped in the water-proof fabric that adorns the other UE speakers as well, save for the top and bottom which is made of a smooth plastic. On the front you’ll find the signature “+” and “-” buttons for adjusting volume, both of which are slightly raised making it easy to find the buttons without needing to even look at the speaker. The Wonderboom is technically IPX7 waterproof, meaning you can submerge it for up to 30 minutes in a meter of water. As useful as that is, what’s even better is that the speaker floats so if it falls in a pool you won’t even have to worry about how long it’s been in there. It’ll just float on top. One interesting feature of this speaker that you should be aware of is that it’s a truly wireless speaker. Not in the way that the Airpods are true wireless obviously, but this speaker doesn’t have a 3.5mm input for an AUX cable like other UE speakers. There’s no passing that fire AUX in this case. As far as range goes this speaker handles distance pretty well. In fact I had so little problems with the connection indoors that I took it outside to really test the range and I easily got passed around 80 feet before skipping occurred. Like previous UE speakers, you can pair this speaker to another Wonderboom if you want to double up and you don’t even have to use an app. Just long press the UE button on top on both speakers to pair them together. This is definitely an improvement over how you previous had to do with since it removes the app from the process. But unfortunately you can only double up a Wonderboom with another Wonderboom, so if you or your friends have a different kind of UE speaker you won’t be able to pair up with them. Kind of a bummer. UE claims a battery life of ten hours but I never quite got that. On max volume I actually got around two hours on my first run, which I thought had to be a mistake. So I redid my test and got exactly 1 hour and 53 minutes. So yeah, nowhere near 10 hours. Of course, it’s worth keeping in mind that this was on maximum volume. On average volume the speaker lasted closer to the claimed ten hours, but I don’t think that makes sense considering the use case of this speaker. One feature that’s both cool and annoying about the speaker is that if you press the volume up and down buttons at the same time, it’ll play a specific tone based on how much battery is left. It’s a cool idea and definitely unique and cute, but I’m a simple person and I would’ve found it way more useful if it just spoke a percentage back to me or something similar. Especially considering how short the battery life is, I’d want to know exactly how much time I have left. So we’ll get into the actual quality in a second, but I was really impressed with just how loud this little speaker got. Whether I was using it in the shower to listen to podcasts or in the yard as background music for a BBQ I never had a problem finding a sufficient output. On the downside this clearly affects the runtime so pick your poison. For its size, the Wonderboom has a pretty decent bass. That said, it isn’t really that controlled. You can really see this during the pre-chorus of the song “1901” by Phoenix as the rolling bass kicks bleed into each other without any defining detail. They push a little too much into the lower mids, fighting with the rhythm guitar. That said, it’s definitely better than something like the UE Roll just because of the size and physics of the speaker. Mids also aren’t the cleanest, with the vocals in the song “Lay Down” by Son Little really overtaking the guitar behind it. On the bright side there is no fuzziness and nothing really sounds muffled. The only gripe that I really had with the highs was the lack of reverb in the claps and hi-hats of “Constellations” by Darwin Deez. They’re audible and do hover nicely over the top of everything but there’s no real definition to them. One good thing about them is that there is no real harshness to speak of. Compact and powerful, the UE Wonderboom can handle anything you throw at it. Overall, I really liked the UE Wonderboom. It’s definitely a quirky little speaker that I can see plenty of people using in warm weather to take to the beach or the park. It might not have the best sound quality (actually it definitely doesn’t), but it’s good enough that music is still enjoyable in the background while you do other things. Bluetooth speakers usually come with a “it depends how you’re going to use it” caveat, but that’s even more-so the case with the Wonderboom. It isn’t meant for audiophiles. I think of the Wonderboom more as a secondary Bluetooth speaker. One that will just get the job done. If you want to listen to your favorite songs at home you might have a larger, better quality speaker or even an entire listening station. But when your friend invites you to go hang out at the beach, reach for the Wonderboom. It’s perfect for that and gets the job done. The newest waterproof speaker from Ultimate Ears.